The item Lucille Ball FAQ: : everything left to know about America's favorite redhead, James Sheridan and Barry Monush, (ebook) represents a specific, individual, material embodiment of a distinct intellectual or artistic creation found in Charlotte Mecklenburg Library. Although countless books and articles have been written about Lucille Ball, most people know only the surface details of her personal life and some basic facts about her popular television series. Lucille Ball FAQ takes us beyond the "Lucy" character to give readers information that might not be common knowledge about one of the world's most beloved entertainers. It can be read straight through, but the FAQ format also invites readers to pick it up and dig in at any point. Background information and anecdotes are provided in such categories as: People Lucy found funny; Lucy at home: her various residences throughout the years; Movie/television/radio/theater projects that never materialized; Lucy's off-camera romantic attachments. 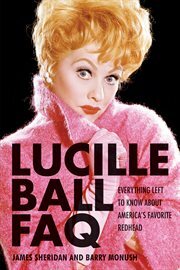 James Sheridan and Barry Monush go beyond the well known facts, making this an indispensable book for all Lucille Ball fans!